Insects (from Latin insectum, a calque of Greek ἔντομον [éntomon], "cut into sections") are a class of invertebrates within the arthropod phylum that have a chitinous exoskeleton, a three-part body (head, thorax and abdomen), three pairs of jointed legs, compound eyes and one pair of antennae. They are the most diverse group of animals on the planet, including more than a million described species and representing more than half of all known living organisms. The number of extant species is estimated at between six and ten million, and potentially represent over 90% of the differing animal life forms on Earth. Insects may be found in nearly all environments, although only a small number of species reside in the oceans, a habitat dominated by another arthropod group, crustaceans. The life cycles of insects vary but most hatch from eggs. Insect growth is constrained by the inelastic exoskeleton and development involves a series of molts. 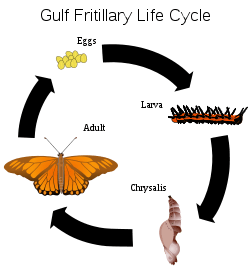 The immature stages can differ from the adults in structure, habit and habitat, and can include a passive pupal stage in those groups that undergo 4-stage metamorphosis (see holometabolism). Insects that undergo 3-stage metamorphosis lack a pupal stage and adults develop through a series of nymphal stages. The higher level relationship of the Hexapoda is unclear. Fossilized insects of enormous size have been found from the Paleozoic Era, including giant dragonflies with wingspans of 55 to 70 cm (22–28 in). The most diverse insect groups appear to have coevolved with flowering plants. Adult insects typically move about by walking, flying or sometimes swimming (see § Locomotion below). As it allows for rapid yet stable movement, many insects adopt a tripedal gait in which they walk with their legs touching the ground in alternating triangles. Insects are the only invertebrates to have evolved flight. Many insects spend at least part of their lives under water, with larval adaptations that include gills, and some adult insects are aquatic and have adaptations for swimming. Some species, such as water striders, are capable of walking on the surface of water. Insects are mostly solitary, but some, such as certain bees, ants and termites, are social and live in large, well-organized colonies. Some insects, such as earwigs, show maternal care, guarding their eggs and young. Insects can communicate with each other in a variety of ways. 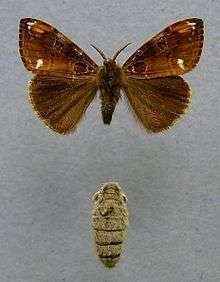 Male moths can sense the pheromones of female moths over great distances. Other species communicate with sounds: crickets stridulate, or rub their wings together, to attract a mate and repel other males. Lampyridae in the beetle order communicate with light. Humans regard certain insects as pests, and attempt to control them using insecticides and a host of other techniques. Some insects damage crops by feeding on sap, leaves or fruits. A few parasitic species are pathogenic. 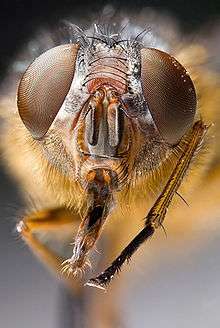 Some insects perform complex ecological roles; blow-flies, for example, help consume carrion but also spread diseases. Insect pollinators are essential to the life-cycle of many flowering plant species on which most organisms, including humans, are at least partly dependent; without them, the terrestrial portion of the biosphere (including humans) would be devastated. Many other insects are considered ecologically beneficial as predators and a few provide direct economic benefit. Silkworms and bees have been used extensively by humans for the production of silk and honey, respectively. In some cultures, people eat the larvae or adults of certain insects. The word "insect" comes from the Latin word insectum, meaning "with a notched or divided body", or literally "cut into", from the neuter singular perfect passive participle of insectare, "to cut into, to cut up", from in- "into" and secare "to cut"; because insects appear "cut into" three sections. Pliny the Elder introduced the Latin designation as a loan-translation of the Greek word ἔντομος (éntomos) or "insect" (as in entomology), which was Aristotle's term for this class of life, also in reference to their "notched" bodies. "Insect" first appears documented in English in 1601 in Holland's translation of Pliny. Translations of Aristotle's term also form the usual word for "insect" in Welsh (trychfil, from trychu "to cut" and mil, "animal"), Serbo-Croatian (zareznik, from rezati, "to cut"), Russian (насекомое nasekomoje, from seč'/-sekat', "to cut"), etc. Evolution has produced enormous variety in insects. 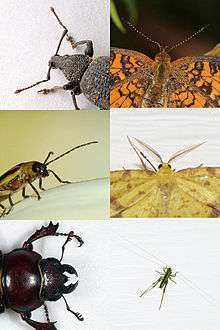 Pictured are some of the possible shapes of antennae. A report in November 2014 unambiguously places the insects in one clade, with the crustaceans and myriapods, as the nearest sister clades. This study resolved insect phylogeny of all extant insect orders, and provides "a robust phylogenetic backbone tree and reliable time estimates of insect evolution." The higher-level phylogeny of the arthropods continues to be a matter of debate and research. In 2008, researchers at Tufts University uncovered what they believe is the world's oldest known full-body impression of a primitive flying insect, a 300 million-year-old specimen from the Carboniferous period. The oldest definitive insect fossil is the Devonian Rhyniognatha hirsti, from the 396-million-year-old Rhynie chert. It may have superficially resembled a modern-day silverfish insect. This species already possessed dicondylic mandibles (two articulations in the mandible), a feature associated with winged insects, suggesting that wings may already have evolved at this time. Thus, the first insects probably appeared earlier, in the Silurian period. Insects can be divided into two groups historically treated as subclasses: wingless insects, known as Apterygota, and winged insects, known as Pterygota. The Apterygota consist of the primitively wingless order of the silverfish (Thysanura). Archaeognatha make up the Monocondylia based on the shape of their mandibles, while Thysanura and Pterygota are grouped together as Dicondylia. The Thysanura themselves possibly are not monophyletic, with the family Lepidotrichidae being a sister group to the Dicondylia (Pterygota and the remaining Thysanura). The Exopterygota likely are paraphyletic in regard to the Endopterygota. Matters that have incurred controversy include Strepsiptera and Diptera grouped together as Halteria based on a reduction of one of the wing pairs – a position not well-supported in the entomological community. The Neuropterida are often lumped or split on the whims of the taxonomist. Fleas are now thought to be closely related to boreid mecopterans. Many questions remain in the basal relationships amongst endopterygote orders, particularly the Hymenoptera. Though the true dimensions of species diversity remain uncertain, estimates range from 2.6–7.8 million species with a mean of 5.5 million. This probably represents less than 20% of all species on Earth, and with only about 20,000 new species of all organisms being described each year, most species likely will remain undescribed for many years unless species descriptions increase in rate. About 850,000–1,000,000 of all described species are insects. Of the 24 orders of insects, four dominate in terms of numbers of described species, with at least 3 million species included in Coleoptera, Diptera, Hymenoptera and Lepidoptera. A recent study estimated the number of beetles at 0.9–2.1 million with a mean of 1.5 million. Insects have segmented bodies supported by exoskeletons, the hard outer covering made mostly of chitin. 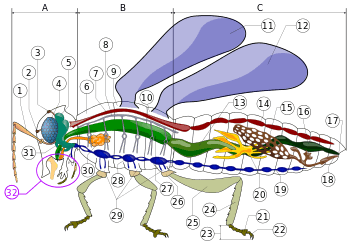 The segments of the body are organized into three distinctive but interconnected units, or tagmata: a head, a thorax and an abdomen. The head supports a pair of sensory antennae, a pair of compound eyes, and, if present, one to three simple eyes (or ocelli) and three sets of variously modified appendages that form the mouthparts. The thorax has six segmented legs—one pair each for the prothorax, mesothorax and the metathorax segments making up the thorax—and, none, two or four wings. The abdomen consists of eleven segments, though in a few species of insects, these segments may be fused together or reduced in size. The abdomen also contains most of the digestive, respiratory, excretory and reproductive internal structures. :22–48 Considerable variation and many adaptations in the body parts of insects occur, especially wings, legs, antenna and mouthparts. The salivary glands (element 30 in numbered diagram) in an insect's mouth produce saliva. The salivary ducts lead from the glands to the reservoirs and then forward through the head to an opening called the salivarium, located behind the hypopharynx. By moving its mouthparts (element 32 in numbered diagram) the insect can mix its food with saliva. The mixture of saliva and food then travels through the salivary tubes into the mouth, where it begins to break down. Some insects, like flies, have extra-oral digestion. Insects using extra-oral digestion expel digestive enzymes onto their food to break it down. This strategy allows insects to extract a significant proportion of the available nutrients from the food source. :31 The gut is where almost all of insects' digestion takes place. It can be divided into the foregut, midgut and hindgut. Insect respiration is accomplished without lungs. Instead, the insect respiratory system uses a system of internal tubes and sacs through which gases either diffuse or are actively pumped, delivering oxygen directly to tissues that need it via their trachea (element 8 in numbered diagram). Since oxygen is delivered directly, the circulatory system is not used to carry oxygen, and is therefore greatly reduced. The insect circulatory system has no veins or arteries, and instead consists of little more than a single, perforated dorsal tube which pulses peristaltically. Toward the thorax, the dorsal tube (element 14) divides into chambers and acts like the insect's heart. The opposite end of the dorsal tube is like the aorta of the insect circulating the hemolymph, arthropods' fluid analog of blood, inside the body cavity. :61–65 Air is taken in through openings on the sides of the abdomen called spiracles. The respiratory system is an important factor that limits the size of insects. As insects get bigger, this type of oxygen transport gets less efficient and thus the heaviest insect currently weighs less than 100 g. However, with increased atmospheric oxygen levels, as happened in the late Paleozoic, larger insects were possible, such as dragonflies with wingspans of more than two feet. 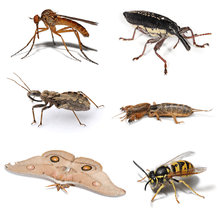 There are many different patterns of gas exchange demonstrated by different groups of insects. Gas exchange patterns in insects can range from continuous and diffusive ventilation, to discontinuous gas exchange. :65–68 During continuous gas exchange, oxygen is taken in and carbon dioxide is released in a continuous cycle. In discontinuous gas exchange, however, the insect takes in oxygen while it is active and small amounts of carbon dioxide are released when the insect is at rest. Diffusive ventilation is simply a form of continuous gas exchange that occurs by diffusion rather than physically taking in the oxygen. Some species of insect that are submerged also have adaptations to aid in respiration. As larvae, many insects have gills that can extract oxygen dissolved in water, while others need to rise to the water surface to replenish air supplies which may be held or trapped in special structures. The insect circulatory system utilizes hemolymph, a tissue analogous to blood that circulates in the interior of the insect body, while remaining in direct contact with the animal's tissues. It is composed of plasma in which hemocytes are suspended. In addition to hemocytes, the plasma also contains many chemicals. It is also the major tissue type of the open circulatory system of arthropods, characteristic of spiders, crustaceans and insects. Some of the oldest and most successful insect groups, such Endopterygota, use a system of complete metamorphosis. :143 Complete metamorphosis is unique to a group of certain insect orders including Diptera, Lepidoptera and Hymenoptera. This form of development is exclusive and not seen in any other arthropods. Many insects possess very sensitive and, or specialized organs of perception. Some insects such as bees can perceive ultraviolet wavelengths, or detect polarized light, while the antennae of male moths can detect the pheromones of female moths over distances of many kilometers. The yellow paper wasp (Polistes versicolor) is known for its wagging movements as a form of communication within the colony; it can waggle with a frequency of 10.6±2.1 Hz (n=190). These wagging movements can signal the arrival of new material into the nest and aggression between workers can be used to stimulate others to increase foraging expeditions. 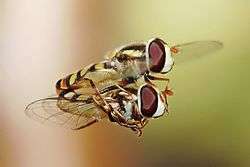 There is a pronounced tendency for there to be a trade-off between visual acuity and chemical or tactile acuity, such that most insects with well-developed eyes have reduced or simple antennae, and vice versa. There are a variety of different mechanisms by which insects perceive sound, while the patterns are not universal, insects can generally hear sound if they can produce it. Different insect species can have varying hearing, though most insects can hear only a narrow range of frequencies related to the frequency of the sounds they can produce. 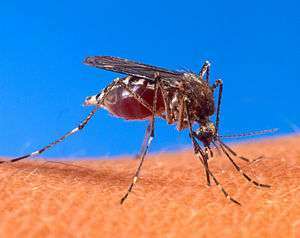 Mosquitoes have been found to hear up to 2 kHz, and some grasshoppers can hear up to 50 kHz. Certain predatory and parasitic insects can detect the characteristic sounds made by their prey or hosts, respectively. For instance, some nocturnal moths can perceive the ultrasonic emissions of bats, which helps them avoid predation. :87–94 Insects that feed on blood have special sensory structures that can detect infrared emissions, and use them to home in on their hosts. Insects were the earliest organisms to produce and sense sounds. Insects make sounds mostly by mechanical action of appendages. In grasshoppers and crickets, this is achieved by stridulation. Cicadas make the loudest sounds among the insects by producing and amplifying sounds with special modifications to their body and musculature. The African cicada Brevisana brevis has been measured at 106.7 decibels at a distance of 50 cm (20 in). Some insects, such as the Helicoverpa zea moths, hawk moths and Hedylid butterflies, can hear ultrasound and take evasive action when they sense that they have been detected by bats. Some moths produce ultrasonic clicks that were once thought to have a role in jamming bat echolocation. The ultrasonic clicks were subsequently found to be produced mostly by unpalatable moths to warn bats, just as warning colorations are used against predators that hunt by sight. Some otherwise palatable moths have evolved to mimic these calls. More recently, the claim that some moths can jam bat sonar has been revisited. Ultrasonic recording and high-speed infrared videography of bat-moth interactions suggest the palatable tiger moth really does defend against attacking big brown bats using ultrasonic clicks that jam bat sonar. Some species use vibrations for communicating within members of the same species, such as to attract mates as in the songs of the shield bug Nezara viridula. Vibrations can also be used to communicate between entirely different species; lycaenid (gossamer-winged butterfly) caterpillars which are myrmecophilous (living in a mutualistic association with ants) communicate with ants in this way. The Madagascar hissing cockroach has the ability to press air through its spiracles to make a hissing noise as a sign of aggression; the Death's-head Hawkmoth makes a squeaking noise by forcing air out of their pharynx when agitated, which may also reduce aggressive worker honey bee behavior when the two are in close proximity. 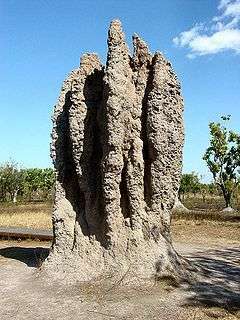 Social insects, such as termites, ants and many bees and wasps, are the most familiar species of eusocial animal. They live together in large well-organized colonies that may be so tightly integrated and genetically similar that the colonies of some species are sometimes considered superorganisms. It is sometimes argued that the various species of honey bee are the only invertebrates (and indeed one of the few non-human groups) to have evolved a system of abstract symbolic communication where a behavior is used to represent and convey specific information about something in the environment. In this communication system, called dance language, the angle at which a bee dances represents a direction relative to the sun, and the length of the dance represents the distance to be flown. :309–311 Though perhaps not as advanced as honey bees, bumblebees also potentially have some social communication behaviors. Bombus terrestris, for example, exhibit a faster learning curve for visiting unfamiliar, yet rewarding flowers, when they can see a conspecific foraging on the same species. The eusocial insects build nest, guard eggs, and provide food for offspring full-time (see Eusociality). 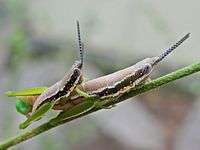 Most insects, however, lead short lives as adults, and rarely interact with one another except to mate or compete for mates. A small number exhibit some form of parental care, where they will at least guard their eggs, and sometimes continue guarding their offspring until adulthood, and possibly even feeding them. Another simple form of parental care is to construct a nest (a burrow or an actual construction, either of which may be simple or complex), store provisions in it, and lay an egg upon those provisions. The adult does not contact the growing offspring, but it nonetheless does provide food. This sort of care is typical for most species of bees and various types of wasps. Many adult insects use six legs for walking and have adopted a tripedal gait. The tripedal gait allows for rapid walking while always having a stable stance and has been studied extensively in cockroaches. The legs are used in alternate triangles touching the ground. For the first step, the middle right leg and the front and rear left legs are in contact with the ground and move the insect forward, while the front and rear right leg and the middle left leg are lifted and moved forward to a new position. When they touch the ground to form a new stable triangle the other legs can be lifted and brought forward in turn and so on. The purest form of the tripedal gait is seen in insects moving at high speeds. However, this type of locomotion is not rigid and insects can adapt a variety of gaits. For example, when moving slowly, turning, or avoiding obstacles, four or more feet may be touching the ground. Insects can also adapt their gait to cope with the loss of one or more limbs. Chemical defense is another important defense found amongst species of Coleoptera and Lepidoptera, usually being advertised by bright colors, such as the Monarch butterfly. They obtain their toxicity by sequestering the chemicals from the plants they eat into their own tissues. Some Lepidoptera manufacture their own toxins. Predators that eat poisonous butterflies and moths may become sick and vomit violently, learning not to eat those types of species; this is actually the basis of Müllerian mimicry. A predator who has previously eaten a poisonous lepidopteran may avoid other species with similar markings in the future, thus saving many other species as well. Some ground beetles of the Carabidae family can spray chemicals from their abdomen with great accuracy, to repel predators. Many insects are considered pests by humans. Insects commonly regarded as pests include those that are parasitic (e.g. lice, bed bugs), transmit diseases (mosquitoes, flies), damage structures (termites), or destroy agricultural goods (locusts, weevils). Many entomologists are involved in various forms of pest control, as in research for companies to produce insecticides, but increasingly rely on methods of biological pest control, or biocontrol. Biocontrol uses one organism to reduce the population density of another organism — the pest — and is considered a key element of integrated pest management. Although pest insects attract the most attention, many insects are beneficial to the environment and to humans. Some insects, like wasps, bees, butterflies and ants, pollinate flowering plants. 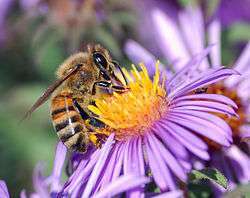 Pollination is a mutualistic relationship between plants and insects. As insects gather nectar from different plants of the same species, they also spread pollen from plants on which they have previously fed. This greatly increases plants' ability to cross-pollinate, which maintains and possibly even improves their evolutionary fitness. This ultimately affects humans since ensuring healthy crops is critical to agriculture. As well as pollination ants help with seed distribution of plants. This helps to spread the plants which increases plant diversity. This leads to an overall better environment. A serious environmental problem is the decline of populations of pollinator insects, and a number of species of insects are now cultured primarily for pollination management in order to have sufficient pollinators in the field, orchard or greenhouse at bloom time. :240–243 Another solution, as shown in Delaware, has been to raise native plants to help support native pollinators like L. vierecki. Insects also produce useful substances such as honey, wax, lacquer and silk. Honey bees have been cultured by humans for thousands of years for honey, although contracting for crop pollination is becoming more significant for beekeepers. The silkworm has greatly affected human history, as silk-driven trade established relationships between China and the rest of the world. Due to the abundance of insects and a worldwide concern of food shortages, the Food and Agriculture Organisation of the United Nations considers that the world may have to, in the future, regard the prospects of eating insects as a food staple. Insects are noted for their nutrients, having a high content of protein, minerals and fats and are eaten by one-third of the global population. 1 2 Engel, Michael S.; David A. Grimaldi (2004). "New light shed on the oldest insect". Nature. 427 (6975): 627–630. Bibcode:2004Natur.427..627E. doi:10.1038/nature02291. PMID 14961119. 1 2 Chapman, A. D. (2006). Numbers of living species in Australia and the World. Canberra: Australian Biological Resources Study. ISBN 978-0-642-56850-2. ↑ Wilson, E.O. "Threats to Global Diversity". Archived from the original on 20 February 2015. Retrieved 17 May 2009. ↑ Novotny, Vojtech; Basset, Yves; Miller, Scott E.; Weiblen, George D.; Bremer, Birgitta; Cizek, Lukas; Drozd, Pavel (2002). "Low host specificity of herbivorous insects in a tropical forest". Nature. 416 (6883): 841–844. Bibcode:2002Natur.416..841N. doi:10.1038/416841a. PMID 11976681. 1 2 Erwin, Terry L. (1997). Biodiversity at its utmost: Tropical Forest Beetles. pp. 27–40. In: Reaka-Kudla, M. L.; Wilson, D. E.; Wilson, E. O. (eds.). Biodiversity II. Joseph Henry Press, Washington, D.C.
↑ Vincent Brian Wigglesworth. "Insect". Encyclopædia Britannica online. Retrieved 19 April 2012. 1 2 Harper, Douglas; Dan McCormack (November 2001). "Online Etymological Dictionary". Online Etymological Dictionary. LogoBee.com. p. 1. Retrieved 1 November 2011. ↑ "Palaeos invertebrates:Arthropoda". Palaeos Invertebrates. 3 May 2002. Archived from the original on 15 February 2009. Retrieved 6 May 2009. 1 2 Misof, et.al., Bernhard (7 November 2014). "Phylogenomics resolves the timing and pattern of insect evolution". Science. 346 (6210): 763–767. Bibcode:2014Sci...346..763M. doi:10.1126/science.1257570. PMID 25378627. ↑ "Evolution of insect flight". Malcolm W. Browne. 25 October 1994. Retrieved 6 May 2009. ↑ "Tree of Life Web Project. Version 1 January 1995 (temporary) of Arthropoda". Tree of Life Web Project. 1995. Retrieved 9 May 2009. ↑ "Researchers Discover Oldest Fossil Impression of a Flying Insect". Newswise. 14 October 2008. Retrieved 21 September 2014. ↑ Rice, C. M.; Ashcroft, W. A.; Batten, D. J.; Boyce, A. J.; Caulfield, J. B. D.; Fallick, A. E.; Hole, M. J.; Jones, E.; Pearson, M. J.; Rogers, G.; Saxton, J. M.; Stuart, F. M.; Trewin, N. H.; Turner, G. (1995). "A Devonian auriferous hot spring system, Rhynie, Scotland". Journal of the Geological Society, London. 152 (2): 229–250. doi:10.1144/gsjgs.152.2.0229. ↑ Wiegmann BM, Trautwein MD, Winkler IS, Barr NB, Kim JW, Lambkin C, Bertone MA, Cassel BK, Bayless KM, Heimberg AM, Wheeler BM, Peterson KJ, Pape T, Sinclair BJ, Skevington JH, Blagoderov V, Caravas J, Kutty SN, Schmidt-Ott U, Kampmeier GE, Thompson FC, Grimaldi DA, Beckenbach AT, Courtney GW, Friedrich M, Meier R, Yeates DK (2011). "Episodic radiations in the fly tree of life". Proceedings of the National Academy of Sciences. 108 (14): 5690–5695. Bibcode:2011PNAS..108.5690W. doi:10.1073/pnas.1012675108. PMC 3078341 . PMID 21402926. ↑ Garwood, Russell J.; Sutton, Mark D. (2010). "X-ray micro-tomography of Carboniferous stem-Dictyoptera: New insights into early insects". Biology Letters. 6 (5): 699–702. doi:10.1098/rsbl.2010.0199. PMC 2936155 . PMID 20392720. Retrieved 9 June 2015. ↑ Rasnitsyn, A. P.; Quicke, D. L. J. (2002). History of Insects. Kluwer Academic Publishers. ISBN 1-4020-0026-X. 1 2 J. Stein Carter (29 March 2005). "Coevolution and Pollination". University of Cincinnati. Archived from the original on 30 April 2009. Retrieved 9 May 2009. ↑ Sahney, S.; Benton, M. J.; Falcon-Lang, H. J. (2010). "Rainforest collapse triggered Pennsylvanian tetrapod diversification in Euramerica". Geology. 38 (12): 1079–1082. Bibcode:2010Geo....38.1079S. doi:10.1130/G31182.1. ↑ "Coevolution and Pollination". University of Cincinnati. Archived from the original on 30 April 2009. Retrieved 9 May 2009. ↑ "Insecta". Tree of Life Web Project. 2002. Retrieved 12 May 2009. 1 2 3 4 5 6 7 8 9 10 11 12 13 14 15 16 17 18 19 20 21 22 23 24 25 26 Gullan, P.J. ; Cranston, P.S. (2005). The Insects: An Outline of Entomology (3 ed.). Oxford: Blackwell Publishing. ISBN 1-4051-1113-5. ↑ Kendall, David A. (2009). "Classification of Insect". Retrieved 9 May 2009. ↑ Gilliott, Cedric (1995). Entomology (2 ed.). Springer-Verlag New York, LLC. p. 96. ISBN 0-306-44967-6. ↑ Kapoor, V.C. C. (1998). Principles and Practices of Animal Taxonomy. 1 (1 ed.). Science Publishers. p. 48. ISBN 1-57808-024-X. ↑ Johnson, K. P.; Yoshizawa, K.; Smith, V. S. (2004). "Multiple origins of parasitism in lice". Proceedings of the Royal Society of London. 271 (1550): 1771–1776. doi:10.1098/rspb.2004.2798. PMC 1691793 . PMID 15315891. ↑ Terry, M. D.; Whiting, M. F. (2005). "Mantophasmatodea and phylogeny of the lower neopterous insects". Cladistics. 21 (3): 240–257. doi:10.1111/j.1096-0031.2005.00062.x. ↑ Lo, Nathan; Tokuda, Gaku; Watanabe, Hirofumi; Rose, Harley; Slaytor, Michael; Maekawa, Kiyoto; Bandi, Claudio; Noda, Hiroaki (2000). "Evidence from multiple gene sequences indicates that termites evolved from wood-feeding cockroaches". Current Biology. 10 (13): 801–804. doi:10.1016/S0960-9822(00)00561-3. PMID 10898984. ↑ Bonneton, F.; Brunet, F. G.; Kathirithamby J. & Laudet, V. (2006). "The rapid divergence of the ecdysone receptor is a synapomorphy for Mecopterida that clarifies the Strepsiptera problem". Insect Molecular Biology. 15 (3): 351–362. doi:10.1111/j.1365-2583.2006.00654.x. PMID 16756554. ↑ Whiting, M.F. (2002). "Mecoptera is paraphyletic: multiple genes and phylogeny of Mecoptera and Siphonaptera". Zoologica Scripta. 31 (1): 93–104. doi:10.1046/j.0300-3256.2001.00095.x. 1 2 Stork, N. E.; McBroom, J; Gely, C; Hamilton, A. J. (2015). "New approaches narrow global species estimates for beetles, insects, and terrestrial arthropods". Proceedings of the National Academy of Sciences. 112 (24): 7519–23. doi:10.1073/pnas.1502408112. PMC 4475949 . PMID 26034274. ↑ "O. Orkin Insect zoo". The University of Nebraska Department of Entomology. Archived from the original on 2 June 2009. Retrieved 3 May 2009. 1 2 3 4 5 6 Resh, Vincent H.; Ring T. Carde (2009). Encyclopedia of Insects (2 ed.). U. S. A.: Academic Press. ISBN 0-12-374144-0. ↑ Barnes, R.S.K. ; Calow, P.; Olive, P.; Golding, D.; and Spicer, J. (2001). "Invertebrates with Legs: the Arthropods and Similar Groups". The Invertebrates: A Synthesis. Blackwell Publishing. p. 168. ISBN 0-632-04761-5. ↑ Lowenstam, H.A. ; Weiner, S. (1989). On biomineralization. Oxford University Press US. p. 111. ISBN 0-19-504977-2. ↑ Schneiderman, Howard A. (1960). "Discontinuous respiration in insects: role of the spiracles". Biol. Bull. 119 (3): 494–528. doi:10.2307/1539265. JSTOR 1539265. ↑ Eisemann, C. H.; Jorgensen, W. K.; Merritt, D. J.; Rice, M. J.; Cribb, B. W.; Webb, P. D.; Zalucki, M. P. (1984). "Do insects feel pain? — A biological view". 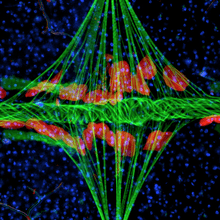 Cellular and Molecular Life Sciences. 40 (2): 1420–1423. doi:10.1007/BF01963580. ↑ Tracey, J; Wilson, RI; Laurent, G; Benzer, S (2003). 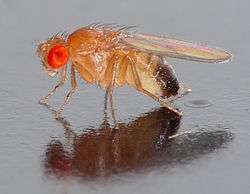 "painless, a Drosophila gene essential for nociception". Cell. 113 (2): 261–273. doi:10.1016/S0092-8674(03)00272-1. PMID 12705873. ↑ Sømme, LS (14 January 2005). "Sentience and pain in invertebrates" (PDF). Norwegian Scientific Committee for Food Safety. Retrieved 30 September 2009. ↑ "General Entomology – Digestive and Excritory system". NC state University. Retrieved 3 May 2009. ↑ "General Entomology – Digestive and Excretory system". NC state University. Retrieved 3 May 2009. ↑ Duncan, Carl D. (1939). A Contribution to The Biology of North American Vespine Wasps (1 ed.). Stanford: Stanford University Press. pp. 24–29. 1 2 3 Nation, James L. (2001). "Digestion". Insect Physiology and Biochemistry (1st ed.). CRC Press. ISBN 0-8493-1181-0. ↑ Meyer, John R. (17 February 2006). "Circulatory System". NC State University: Department of Entomology, NC State University. p. 1. Retrieved 11 October 2009. 1 2 3 Richard W. Merritt; Kenneth W. Cummins; Martin B. Berg (editors) (2007). An Introduction to the Aquatic Insects of North America (4th ed.). Kendall Hunt Publishers. ISBN 978-0-7575-5049-2. ↑ Merritt, RW; KW Cummins & MB Berg (2007). An Introduction To The Aquatic Insects Of North America. Kendall Hunt Publishing Company. ISBN 0-7575-4128-3. ↑ Chapman, R.F. (1998). The Insects; Structure and Function (4th ed.). Cambridge, UK: Cambridge University Press. ISBN 0521578906. ↑ Jacobs, C.G. ; Rezende, G.L. ; Lamers, G.E. ; van der Zee, M. (2013). "The extraembryonic serosa protects the insect egg against desiccation". Proceedings of the Royal Society – Biological series. 280 (1764): 20131082. doi:10.1098/rspb.2013.1082. PMID 23782888. ↑ "Glossary of Lepidopteran and Odonate anatomy". Rare species atlas. Virginia Department of Conservation and Recreation. 2013. Retrieved 14 June 2013. ↑ Hughes, William O. H.; Oldroyd, Benjamin P.; Beekman, Madeleine; Ratnieks, Francis L. W. (2008). "Ancestral Monogamy Shows Kin Selection Is Key to the Evolution of Eusociality". Science. American Association for the Advancement of Science. 320 (5880): 1213–1216. Bibcode:2008Sci...320.1213H. doi:10.1126/science.1156108. PMID 18511689. ↑ Nevo, E.; Coll, M. (2001). "Effect of nitrogen fertilization on Aphis gossypii (Homoptera: Aphididae): variation in size, color, and reproduction". J. Econ. Entomol. 94 (1): 27–32. doi:10.1603/0022-0493-94.1.27. PMID 11233124. ↑ Jahn, G. C.; Almazan, L. P.; Pacia, J. (2005). "Effect of nitrogen fertilizer on the intrinsic rate of increase of the rusty plum aphid, Hysteroneura setariae (Thomas) (Homoptera: Aphididae) on rice (Oryza sativa L.)" (PDF). Environmental Entomology. 34 (4): 938–943. doi:10.1603/0046-225X-34.4.938. ↑ Debbie Hadley. "Where do insects go in winter?". About.com. Retrieved 19 April 2012. ↑ Lee, Richard E Jr. (1989). "Insect Cold-Hardiness: To Freeze or Not to Freeze" (PDF). BioScience. 39 (5): 308–313. doi:10.2307/1311113. JSTOR 1311113. ↑ Ruppert, E.E. ; Fox, R.S. & Barnes, R.D. (2004). Invertebrate Zoology (7 ed.). Brooks / Cole. pp. 523–524. ISBN 0-03-025982-7. ↑ "Insects" (PDF). Alien Life Forms. p. 4. Retrieved 17 May 2009. ↑ Esch, Harald (1971). "Wagging Movements in the Wasp Polistes versicolor Vulgaris Bequaert". Zeitschrift für Vergleichende Physiologie. 72 (3): 221–25. doi:10.1007/bf00297781. ↑ Cator, L. J.; Arthur, BJ; Harrington, LC; Hoy, RR (2009). "Harmonic convergence in the love songs of the dengue vector mosquito". Science. 323 (5917): 1077–1079. Bibcode:2009Sci...323.1077C. doi:10.1126/science.1166541. PMC 2847473 . PMID 19131593. ↑ Möller, R. (2002). A Biorobotics Approach to the Study of Insect Visual Homing Strategies (PDF) (in German). p. 11. ↑ Pugsley, Chris W. (1983). "Literature review of the New Zealand glowworm Arachnocampa luminosa (Diptera: Keroplatidae) and related cave-dwelling Diptera" (PDF). New Zealand Entomologist. 7 (4): 419–424. doi:10.1080/00779962.1983.9722435. ↑ Lloyd, James E. (1984). "Occurrence of Aggressive Mimicry in Fireflies". The Florida Entomologist. 67 (3): 368–376. doi:10.2307/3494715. JSTOR 3494715. ↑ Lloyd, James E.; Erin C. Gentry (2003). The Encyclopedia of Insects. Academic Press. pp. 115–120. ISBN 0-12-586990-8. ↑ Briscoe, AD; Chittka, L (2001). "The evolution of color vision in insects". Annu. Rev. Entomol. 46: 471–510. doi:10.1146/annurev.ento.46.1.471. PMID 11112177. ↑ Walker, T.J., ed. (2001). University of Florida Book of Insect Records. ↑ Kay, Robert E. (1969). "Acoustic signalling and its possible relationship to assembling and navigation in the moth, Heliothis zea". Journal of Insect Physiology. 15 (6): 989–1001. doi:10.1016/0022-1910(69)90139-5. ↑ Spangler, Hayward G. (1988). "Moth hearing, defense, and communication". Annual Review of Entomology. 33 (1): 59–81. doi:10.1146/annurev.ento.33.1.59. ↑ Hristov, N.I. ; Conner, W.E. (2005). "Sound strategy: acoustic aposematism in the bat–tiger moth arms race". Naturwissenschaften. 92 (4): 164–169. Bibcode:2005NW.....92..164H. doi:10.1007/s00114-005-0611-7. PMID 15772807. ↑ Barber, J. R.; W. E. Conner (2007). "Acoustic mimicry in a predator–prey interaction". Proc. Natl. Acad. Sci. 104 (22): 9331–9334. Bibcode:2007PNAS..104.9331B. doi:10.1073/pnas.0703627104. PMC 1890494 . PMID 17517637. ↑ Corcoran, Aaron J.; Jesse R. Barber; William E. Conner (2009). "Tiger Moth Jams Bat Sonar". Science. 325 (5938): 325–327. Bibcode:2009Sci...325..325C. doi:10.1126/science.1174096. ↑ Theiss, Joachim (1982). "Generation and radiation of sound by stridulating water insects as exemplified by the corixids". Behavioral Ecology and Sociobiology. 10 (3): 225–235. doi:10.1007/BF00299689. ↑ Virant-Doberlet, M.; Čokl A. (2004). "Vibrational communication in insects". Neotropical Entomology. 33 (2): 121–134. doi:10.1590/S1519-566X2004000200001. ↑ Bennet-Clark, H.C. (1998). "Size and scale effects as constraints in insect sound communication". Phil. Trans. R. Soc. Lond. B. 353 (1367): 407–419. doi:10.1098/rstb.1998.0219. ↑ Miklas, Nadège; Stritih, Nataša; Čokl, Andrej; Virant-Doberlet, Meta; Renou, Michel (2001). "The Influence of Substrate on Male Responsiveness to the Female Calling Song in Nezara viridula". Journal of Insect Behavior. 14 (3): 313–332. doi:10.1023/A:1011115111592. ↑ DeVries, P. J. (1990). "Enhancement of symbiosis between butterfly caterpillars and ants by vibrational communication". Science. 248 (4959): 1104–1106. Bibcode:1990Sci...248.1104D. doi:10.1126/science.248.4959.1104. PMID 17733373. ↑ Nelson, Margaret C.; Jean Fraser (1980). "Sound production in the cockroach, Gromphadorhina portentosa: evidence for communication by hissing". Behavioral Ecology and Sociobiology. 6 (4): 305–314. doi:10.1007/BF00292773. ↑ Moritz, R. F. A.; Kirchner, W. H.; Crewe, R. M. (1991). "Chemical camouflage of the death's head hawkmoth (Acherontia atropos L.) in honeybee colonies". Naturwissenschaften. 78 (4): 179–182. Bibcode:1991NW.....78..179M. doi:10.1007/BF01136209. ↑ Brewer, Gary. "Social insects". North Dakota State University. Archived from the original on 21 March 2008. Retrieved 6 May 2009. ↑ Leadbeater, E.; L. Chittka (2007). "The dynamics of social learning in an insect model, the bumblebee (Bombus terrestris)". Behavioral Ecology and Sociobiology. 61 (11): 1789–1796. doi:10.1007/s00265-007-0412-4. ↑ Salt, R.W. (1961). "Principles of Insect Cold-Hardiness". Annual Review of Entomology. Lethbirdge, Alberta, Canada. 6: 55–74. doi:10.1146/annurev.en.06.010161.000415. ↑ "Social Insects". North Dakota State University. Archived from the original on 21 March 2008. Retrieved 12 October 2009. ↑ Jockusch, EL; Ober, KA (September 2004). "Hypothesis testing in evolutionary developmental biology: a case study from insect wings". Journal of Heredity. 95 (5): 382–396. doi:10.1093/jhered/esh064. PMID 15388766. ↑ Dudley, R (1998). "Atmospheric oxygen, giant Paleozoic insects and the evolution of aerial locomotor performance" (PDF). Journal of Experimental Biology. 201 (8): 1043–1050. ↑ Yates, Diana (2008). Birds migrate together at night in dispersed flocks, new study indicates. University of Illinois at Urbana – Champaign. Retrieved on 26 April 2009. ↑ Drake, V. A.; R. A. Farrow (1988). "The Influence of Atmospheric Structure and Motions on Insect Migration". Annual Review of Entomology. 33: 183–210. doi:10.1146/annurev.en.33.010188.001151. ↑ Bart Geerts and Dave Leon (2003). P5A.6 Fine-Scale Vertical Structure of a Cold Front As Revealed By Airborne 95 GHZ Radar. University of Wyoming. Retrieved on 26 April 2009. 1 2 Biewener, Andrew A (2003). Animal Locomotion. Oxford University Press. ISBN 0-19-850022-X. ↑ Ikawa, Terumi; Okabe, Hidehiko; Hoshizaki, Sugihiko; Kamikado, Takahiro; Cheng, Lanna (2004). "Distribution of the oceanic insects Halobates (Hemiptera: Gerridae) off the south coast of Japan". Entomological Science. 7 (4): 351–357. doi:10.1111/j.1479-8298.2004.00083.x. ↑ Mill, P. J.; R. S. Pickard (1975). "Jet-propulsion in anisopteran dragonfly larvae". Journal of Comparative Physiology A. 97 (4): 329–338. doi:10.1007/BF00631969. ↑ Linsenmair, K.; Jander R. (1976). "Das "entspannungsschwimmen" von Velia and Stenus". Naturwissenschaften. 50 (6): 231. Bibcode:1963NW.....50..231L. doi:10.1007/BF00639292. ↑ Bush, J. W. M.; David L. Hu (2006). "Walking on Water: Biolocomotion at the Interface" (PDF). Annu. Rev. Fluid Mech. 38: 339–369. Bibcode:2006AnRFM..38..339B. doi:10.1146/annurev.fluid.38.050304.092157. Archived from the original (PDF) on 10 July 2007. ↑ Schowalter, Timothy Duane (2006). Insect ecology: an ecosystem approach (2(illustrated) ed.). Academic Press. p. 572. ISBN 978-0-12-088772-9. ↑ Losey, John E.; Vaughan, Mace (2006). "The Economic Value of Ecological Services Provided by Insects". BioScience. 56 (4): 311–323(13). doi:10.1641/0006-3568(2006)56[311:TEVOES]2.0.CO;2. 1 2 3 4 Evans, Arthur V.; Charles Bellamy (2000). An Inordinate Fondness for Beetles. University of California Press. ISBN 978-0-520-22323-3. ↑ "Photos: Masters of Disguise—Amazing Insect Camouflage". Retrieved 11 June 2015. ↑ Bedford, Geoffrey O. (1978). "Biology and Ecology of the Phasmatodea". Annual Review of Entomology. 23: 125–149. doi:10.1146/annurev.en.23.010178.001013. ↑ Meyer, A. (2006). "Repeating Patterns of Mimicry". PLoS Biology. 4 (10): e341. doi:10.1371/journal.pbio.0040341. PMC 1617347 . PMID 17048984. ↑ Kricher, John (1999). "6". A Neotropical Companion. Princeton University Press. pp. 157–158. ISBN 978-0-691-00974-2. ↑ "Pollinator Factsheet" (PDF). United States Forest Service. Archived from the original (PDF) on 10 April 2008. Retrieved 19 April 2012. ↑ Bale, JS; van Lenteren, JC; Bigler, F. (27 February 2008). "Biological control and sustainable food production". Philosophical Transactions of the Royal Society of London. Series B: Biological Sciences. 363 (1492): 761–776. doi:10.1098/rstb.2007.2182. PMC 2610108 . PMID 17827110. ↑ Colborn, T; vom Saal, FS; Soto, AM (October 1993). "Developmental effects of endocrine-disrupting chemicals in wildlife and humans". Environmental Health Perspectives. 101 (5): 378–384. doi:10.2307/3431890. JSTOR 3431890. PMC 1519860 . PMID 8080506. ↑ Nakamaru, M; Iwasab, Y; Nakanishic, J (October 2003). "Extinction risk to bird populations caused by DDT exposure". Chemosphere. 53 (4): 377–387. doi:10.1016/S0045-6535(03)00010-9. PMID 12946395. ↑ Holldobler, Wilson (1994). Journey to the ants: a story of scientific exploration. Westminster college McGill Library: Cambridge, Mass. :Belknap Press of Haravard University Press, 1994. pp. 196–199. ISBN 0-674-48525-4. ↑ Smith, Deborah T (1991). Agriculture and the Environment: The 1991 Yearbook of Agriculture (1991 ed.). United States Government Printing. ISBN 0-16-034144-2. ↑ Kuehn, F. Coordinator. (2015). "Farming for native bees". World Wide Web electronic publication. (Accessed: September 22, 2015). ↑ Camargo, Rafael; Paulo Oliveira (2011). "Natural history of the Neotrobical arboreal ant, Odontomachus hastatus: Nest sites, foraging schedule, and diet". Journal of Insect Science. 12 (18): 1–9. doi:10.1673/031.012.4801. PMC 3476954 . PMID 22957686. ↑ "Biocontrol Network – Beneficial Insects". Biocontrol Network. Retrieved 9 May 2009. ↑ Davidson, RH; William F. Lyon (1979). Insect Pests of Farm, Garden, and Orchard. Wiley, John & Sons. p. 38. ISBN 0-471-86314-9. ↑ Dossey, Aaron T. (December 2010). "Insects and their chemical weaponry: New potential for drug discovery". Natural Product Reports. Royal Society of Chemistry (RSC Publishing). 27 (12): Pages 1737–1757. doi:10.1039/c005319h. PMID 20957283. ↑ Sherman, Ronald A.; Pechter, Edward A. (1987). "Maggot therapy: a review of the therapeutic applications of fly larvae in human medicine, especially for treating osteomyelitis". Medical and Veterinary Entomology. 2 (3): Pages 225–230. doi:10.1111/j.1365-2915.1988.tb00188.x. ↑ Michels, John (1880). John Michels, ed. Science. 1. American Association for the Advance of Science. 229 Broadway ave., N.Y.: American Association for the Advance of Science. pp. 2090pp. ISBN 1-930775-36-9. ↑ Maierbrugger, Arno (14 May 2013). "UN: Insects are 'food of the future' (video)". Inside Investor. Retrieved 17 May 2013.